Aim : The aim was to evaluate the influence of water storage on fiber post-resin composite adhesion after different postsurface treatments. Materials and Methods : Forty-two fiber posts were used. Half of them were treated by hydrogen-peroxide and the other half were sandblasted. The adhesive (Single Bond, 3M, USA) was applied on the post. Core was built-up using flowable composite (Ζlite Flow, Bisco, USA). The specimens were divided into eight groups. Group 1 was treated with H 2 O 2 . Groups 2-4 were treated with H2O2 but stored for 3, 6, and 9 months, respectively. Groups 5-8 were sandblasted and stored for 0, 3, 6, and 9 months. μTBS was measured and data analyzed using one-way ANOVA and Tukey HSD. The fractured surfaces were evaluated by a stereomicroscope. The morphology of interfaces was assessed under SEM. H 2 O 2 -treated groups showed higher bond-strength. Results : The effect of "surface-treatment method" and "storage-time" was significant (P<0.0001), but there was no significant difference for their interaction effect (P=0.05). Water aging significantly decreased μTBS. Conclusions : Water aging significantly decreased microtensile bond strength regardless of the type of post surface treatment. Water as the main element in the oral cavity can interfere with long-term durability of the bond. For this reason, water storage is considered as an in vitro accelerated aging test. 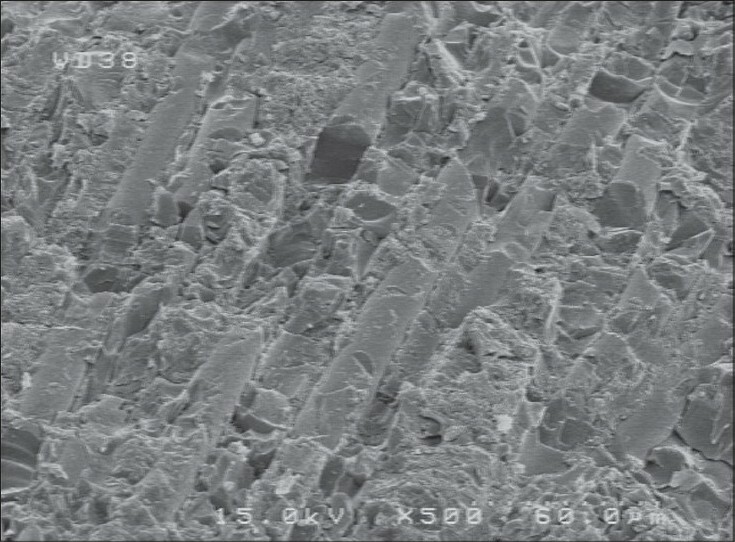 , Due to the lack of definitive information concerning the role of different post treatments in long-term storage, the present study was carried out to evaluate the effect of two different surface treatments on the microtensile bond strength of quartz fiber posts to composite core in long-term storage time. The null hypotheses were that storage duration and post surface treatment had no effect on bond strength of fiber posts to resin core. Forty-eight white quartz fiber posts (DT Light-Post radiopaque, RTD, Grenoble, France) with maximum 1.8 mm diameter were selected. Twenty-four posts were immersed in 24% hydrogen peroxide solution for 10 min at room temperature and then rinsed under running water for 2 min and gently air dried. The remaining posts were sandblasted with 110 μm aluminum oxide particles (Rocatector Delta, 3M, ESPE, Seefeld, Germany) for 5 s at 0.28 MPa from a 1 cm distance. A light cured fifth generation adhesive (Single Bond, 3M ESPE, Ltd, USA) was used on all the posts according to the manufacturer's instructions. Core build up was, then, performed using a light cured flowable composite (Ζlite Flow, Bisco, Inc, Shaumburg, IL, USA). Each post was positioned upright on a glass slab and fixed with a drop of sticky wax. A cylindrical matrix was made with 10 mm in diameter and the length was equal to the nontapered portion of the post (6 mm). It was placed around the post and adjusted so that the post was positioned exactly at the center. Flowable composite was applied on the post in 1 mm thickness increments and each layer was cured separately using a halogen light curing unit (Degulux, Degussa Dental, Hanau, Germany). To ensure optimal polymerization of the core material an additional 40 s curing was performed from the bottom of the cylinder before removing the matrix. Hydrogen peroxide treated samples were divided into four groups (six in each group). Group 1 was not stored and Groups 2, 3, and 4 were stored in deionized water at 37°C for 3, 6, and 9 months, respectively. Groups 5, 6, 7, and 8 included the sandblasted samples in the same manner. Then, by means of a water-cooled blade of a sectioning machine (IsoMet, Buehler LTD., Lake Bluff, IL, USA), first two sections parallel to the long axis of the post and then sections perpendicular to the long axis of the post were done, resulting in sections containing the post in the center and composite cores on both ends. The final sections had 1±0.1 mm diameter measured by a digital caliper (Mitutoyo CD15, Mitutoyo Co., Kawasaki, Japan). Two sticks were selected from each post. After the specific storage time, each stick was glued to the two free sliding components of a jig mounted on the microtensile tester (EZ Test, Shimadzu Co., Kyoto, Japan). This set-up was designed to apply pure tensile forces to the post-core interface. The specimens were loaded at a crosshead speed of 0.5 mm/min until failure. Bond strength was expressed in MPa, by dividing the load at failure point (N) to the bonding surface area (mm). 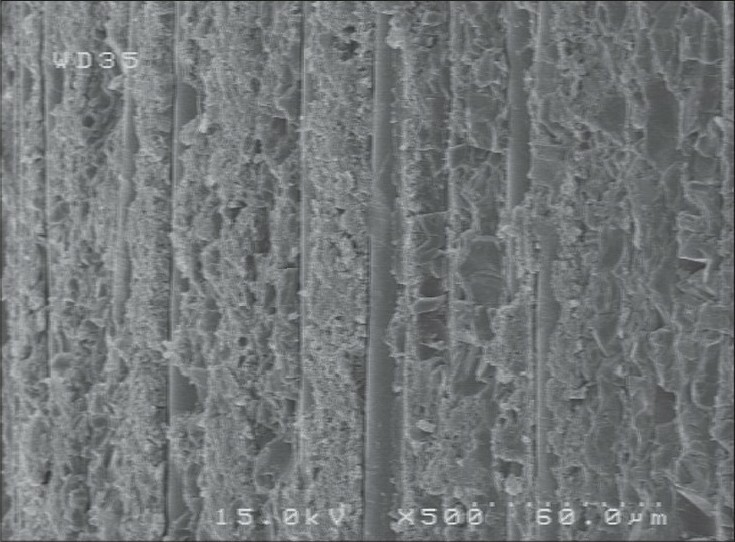 Failure modes of the samples were assessed using a stereomicroscope (Nikon Eclips E600, Tokyo, Japan) at 20Χ magnification and recorded as cohesive failure (failure in post or core material), adhesive failure (failure at the interface of post and core material), and mixed failure (adhesive-cohesive failure). Two randomly selected fractured sticks of each group were sputter coated with gold-palladium and assessed with scanning electron microscope (JSM-5310, JEOL, Tokyo, Japan) at 500 and 1000 magnifications. Data were analyzed using two-way ANOVA and Tukey HSD test. Statistical significance was set at α= 0.05. Mean and standard deviations of microtensile bond strength of the groups tested are given in [Table 1]. Two-way ANOVA indicated that the main effect of surface treatment and storage duration were significant (P=0.0001). The interaction of surface treatment and storage duration was not significant (P=0.054). Variance analysis demonstrated that significant differences existed among all groups treated with hydrogen peroxide (Group 1-4). Also, all sandblasted groups had significant differences except Group 6 with Group 7 and Group 7 with Group 8. In addition, paired comparisons of sandblasted groups and hydrogen-peroxide-treated groups showed that there were no significant differences between Group 4 with Groups 7 and 8. The mean microtensile bond strength of groups tested had significant differences with each other except Group 4 with 7 and 8, Group 6 with Group 7 and Group 7 with 8. Stereomicroscopic evaluation revealed that all failures occurred as adhesive failure. No cohesive or mixed failures were observed. Assessment of SEM images in the sandblasted groups showed that fibrils were destroyed and some of the fibrils were completely broken. But in groups treated with H 2 O 2 , fibrils were relatively intact and just the epoxy resin between fibrils was eliminated. Voids and disintegrates were observed in stored groups [Figure 1],[Figure 2],[Figure 3],[Figure 4]. Additionally, Epoxy resin existing between fibrils can undergo degradation and dislodgement because of its resinous nature, and this may be the reason for decreased bond strength in the stored groups. In this study, storage duration and condition, type of composite and type of the adhesive system were similar in all the groups. The other finding of this study was that bond strength values of hydrogen-peroxide-treated posts were higher than the sandblasted posts. Equilibrium in absorption of water after 6 months is reason for lack of difference between Group 6 with Group 7 and Group 7 with Group 8 in the sandblasted groups. There were no significant differences between Group 4 with Groups 7 and 8. It means that material saturation and hydrolytic equilibrium in sandblasted groups occurred rapidly in comparison with the hydrogen-peroxide-treated groups. This might be due to the presence of greater amount of epoxy resin in the posts treated with hydrogen peroxide. Since hydrogen peroxide method is more conservative than sandblasting, so the greater content of resin remains after treatment. Paired comparison of the sandblasted groups indicated that bond strength values was not different between Groups 7 and 8, but in the hydrogen peroxide groups decreasing of bond strength continued from Groups 1 to 4. Finally, there were significant differences between the bond strength values of hydrogen peroxide and sandblasted groups. After 6 and 9 months, the presence of higher number of voids and discontinuities between fiber and the resin material could be a reason for this result. SEM observations confirmed all the results and revealed that voids can have negative effects on adhesion. Adhesive area is the weakest area in adhesion of fiber post to composite. Considering the fact that post-core complex is not directly exposed to oral fluids in vivo, and water exposure usually occurs after leakage; the times assessed could be attributed to longer times in vivo. In this study, water storage was assessed without thermal and load cycling. For more similarities to the oral conditions, it is recommended to perform fatigue test in combination with water storage. In addition, in this study, one type of fiber post and adhesive were evaluated, future studies on other types of fiber post and adhesive systems are recommended. Duration of water storage was effective in reducing microtensile bond strength in both treatment groups, although bond strength after 9 months storage was not significantly different between sandblasted and H 2 O 2 -treated groups. 1. Al-Omiri MK, Mahmoud AA, Rayyan MR, Abu-Hammad O. Fracture resistance of teeth restored with post-retained restorations: An overview. J Endod 2010;36:1439-49. 2. Bateman G, Ricketts DN, Saunders WP. Fibre-based post systems: A review. Br Dent J 2003;195:43-8. 3. Qualtrough AJ, Chandler NP, Purton DG. A comparison of the retention of tooth-colored posts. Quintessence Int 2003;34:199-201. 4. Qualtrough AJ, Mannocci F. Tooth-colored post systems: A review. Oper Dent 2003;28:86-91. 5. Schmage P, Cakir FY, Nergiz I, Pfeiffer P. Effect of surface conditioning on the retentive bond strengths of fiber reinforced composite posts. J Prosthet Dent 2009;102:368-77. 6. Grandini S, Goracci C, Monticelli F, Tay FR, Ferrari M. Fatigue resistance and structural characteristics of fiber posts: three-point bending test and SEM evaluation. Dent Mater 2005;21:75-82. 7. Monticelli F, Toledano M, Tay FR, Cury AH, Goracci C, Ferrari M. Post-surface conditioning improves interfacial adhesion in post/core restorations. Dent Mater 2006;22:602-9. 8. Soares CJ, Santana FR, Pereira JC, Araujo TS, Menezes MS. Influence of airborne-particle abrasion on mechanical properties and bond strength of carbon/epoxy and glass/bis-GMA fiber-reinforced resin posts. J Prosthet Dent 2008;99:444-54. 9. Monticelli F, Osorio R, Sadek FT, Radovic I, Toledano M, Ferrari M. Surface treatments for improving bond strength to prefabricated fiber posts: A literature review. Oper Dent 2008;33:346-55. 10. D'Arcangelo C, D'Amario M, Vadini M, De Angelis F, Caputi S. Influence of surface treatments on the flexural properties of fiber posts. J Endod 2007;33:864-7. 11. Xible AA, de Jesus Tavarez RR, de Araujo Cdos R, Bonachela WC. Effect of silica coating and silanization on flexural and composite-resin bond strengths of zirconia posts: An in vitro study. J Prosthet Dent 2006;95:224-9. 12. Grandini S, Chieffi N, Cagidiaco MC, Goracci C, Ferrari M. Fatigue resistance and structural integrity of different types of fiber posts. Dent Mater J 208;27:687-94. 13. Balbosh A, Kern M. Effect of surface treatment on the retention of glass-fiber endodontic posts. J Dent 2006;95:218-23. 14. Bitter K, Priehn K, Martus P. In vitro evaluation of push-out bond strength of various luting agents to tooth colored posts. J Prosthet Dent 2006;95:302-10. 15. Sahafi A, Peutzfeldt A, Ravvnholt G. Resistance to cyclic loading of teeth restored with posts. Clin Oral Invest 2005;9:84-90. 16. Valandro LF, Bottino MA. Microtensile bond strength between Quartz fiber post and resin cement: Effect of post surface treatment. J Endodont Mater 2003;4:271-4. 17. Rödig T, Nusime AK, Konietschke F, Attin T. Effects of different luting agents on bond strengths of fiber-reinforced composite posts to root canal dentin. J Adhes Dent 2010;12:197-205. 18. Sahafi A, Peutzfeldt A. Retention of adhesively bonded posts: effect of pretreatment of the root canal. J Adhes Dent 2009;11:319-23. 19. Bitter K, Neumann K, Kielbassa AM. Effects of pretreatment and thermocycling on bond strength of resin core materials to various fiber-reinforced composite posts. J Adhes Dent 2008;10:481-9. 20. Papacchini F, Monticelli F, Radovic I, Chieffi N, Goracci C, Tay FR, et al. 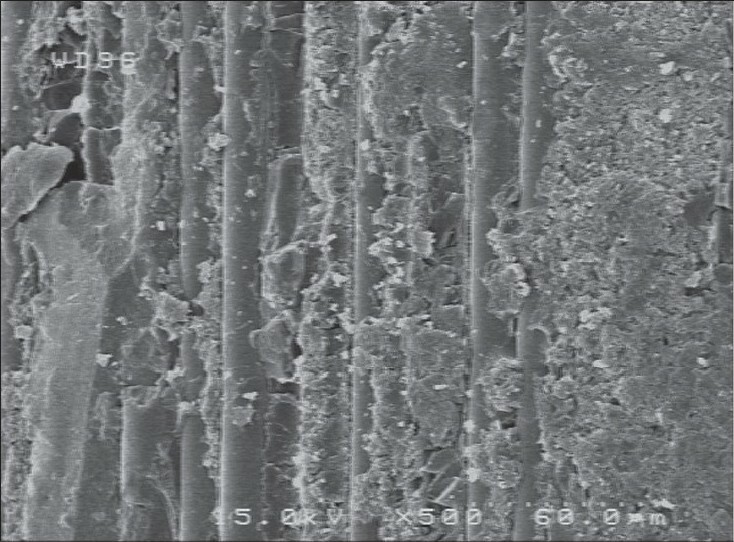 The application of hydrogen peroxide in composite repair. J Biomed Mater Res B Appl Biomater 2007;82:298-304. 21. Prithviraj DR, Soni R, Ramaswamy S, Shruthi DP. Evaluation of the effect of different surface treatments on the retention of posts: A laboratory study. Indian J Dent Res 2010;21:201-6. 22. Vichi A, Vano M, Ferrari M. The effect of different storage and conditions and duration on the fracture strength of three types of translucent fiber posts. Dent Mater 2008;24:832-8. 23. Goracci C, Raffaelli O, Monticelli F, Balleri B, Bertelli E, Ferrari M. The adhesion between prefabricated FRC posts and composite resin cores: Microtensile bond strength with and without post-silanization. Dent Mater 2005;21:437-44. 24. Vano M, Goracci C, Monticelli F, Tognini F, Gabriele M, Tay FR, et al. The adhesion between fibre posts and composite resin cores: The evaluation of microtensile bond strength following various surface chemical treatments to posts. Int Endod J 2006;39:31-9. 25. Labella R, Lambrechts P, Van Meerbeek B, Vanherle G. Polymerization shrinkage and elasticity of flowable composites and filled adhesives. Dent Mater 1999;15:128-37. 26. Monticelli F, Goracci C, Grandini S, García-Godoy F, Ferrari M. Scanning electron microscopic evaluation of fiber post-resin core units built up with different resin composites. Am J Dent 2005;18:61-5. 27. Monticelli F, Goracci C, Ferrari M. Micromorphology of the fiber post-resin core unit: A scanning electron microscopy evaluation. Dent Mater 2004;20:176-83. 28. Radovic I, Monticelli F. Accelerated aging of adhesive-mediated fiber post-resin composite bonds: A modeling approach. J Dent 2007;35:683- 9. 29. Monticelli F, Osorio R, Albaladejo A, Aguilera FS, Tay FR, Ferrari M, et al. Effect of adhesive systems and surface treatment of methacrylate resin-based fiber posts on post-resin-dentin bonds. Am J Dent 2007;20:231-4. 30. 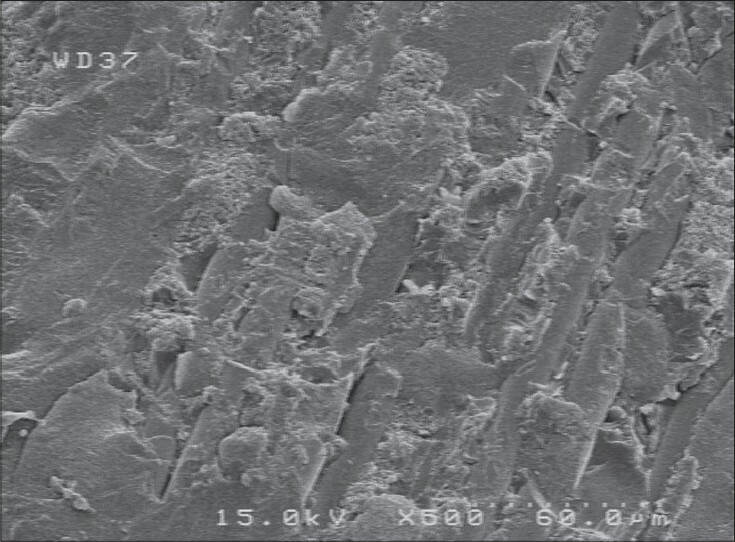 Yenisey M, Kulunk S. Effects of chemical surface treatments of quartz and glass fiber posts on the retention of a composite resin. J Prosthet Dent 2008;99:38-45.